Long-Term Monitoring Surveys at Bird Rock were established in 1982, and are done by volunteers. Photoplot monitoring data from 1982-1994 were sampled in 50 cm by 50 cm plots and have not yet been entered in MARINe database. In 1994 these plots were extended to 50 cm by 75 cm when Bird Rock was formally added to MARINe. Since 2008 Bird Rock has been monitored largely through volunteer efforts; field data have been collected, but not scored nor entered into database. Barnacle plots at Bird Rock consist primarily of Chthamalus dalli/fissus (species were not distinguished), with Tetraclita also present at low levels. Cover of Chthamalus typically varied inversely with rock cover, with relatively little else occurring in these plots. Barnacle cover declined from ~60% to ~35% cover levels during 1999-2000 (coincident with the La Niña that immediately followed the 1997-1998 El Niño), and did not return to pre-1999 levels through 2008. 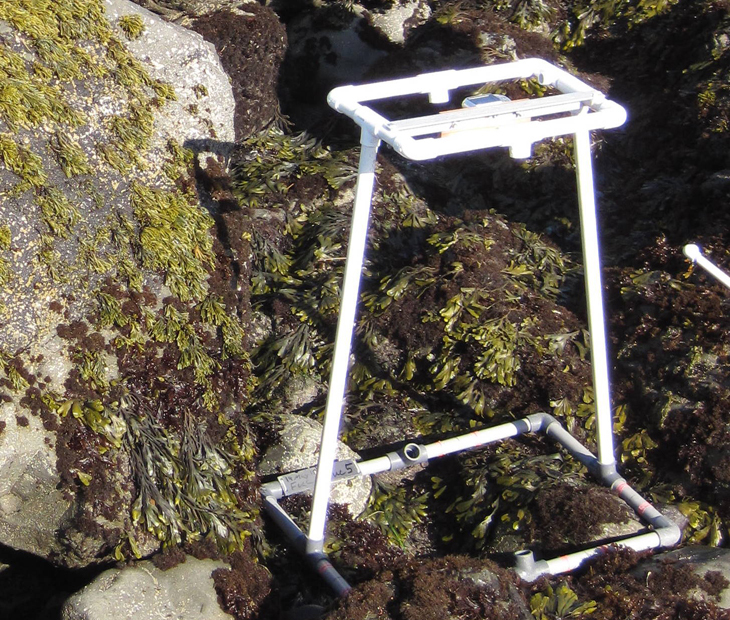 Annual motile invertebrate counts were initiated in barnacle plots in 2009. Littorina spp. were abundant in 2009-2010, with much lower numbers of limpets in these plots. 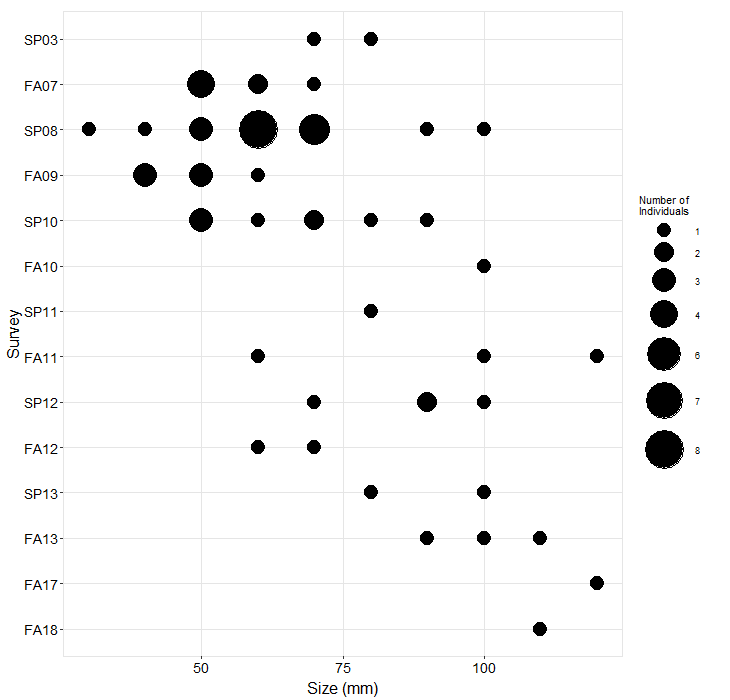 With few exceptions, Mytilus cover was greater than Pollicipes cover in Pollicipes plots. Abundances typically varied inversely between the two species. Cover trends were fairly stable over many years, except for high Mytilus/low Pollicipes during 1995-1997 that followed major recruitment of Mytilus during 1995. Annual motile invertebrate counts were initiated in Pollicipes plots in 2009. Littorina spp. increased from 2009 to 2010, while limpets numbers remained stable. Mytilus cover in mussel plots was variable, but mostly low except for 1995-1997 (that, like the Pollicipes plots, followed high recruitment of Mytilus during 1995) and for Spring 2006 which experienced a recruitment event followed by mortality of the settlers by Fall 2006. Articulated corallines, other red algae, Tetraclita, and Anthopleura generally made up the remainder of cover within the plots. Silvetia cover in Silvetia plots predominated, with 90% or greater cover in 1994-1996 followed by gradual declines to ~70% cover through the 1997-1998 El Niño, coincident with sea lions hauling out on/above some of the plots, apparently resulting in urine and feces impacts. Silvetia cover mostly remained in the 70-80% range since 1998 except for declines to ~ 60% cover in 2007-2008. Annual motile invertebrate counts were initiated in Silvetia plots in 2009. Typically found under the Silvetia canopy in 2009-2010, limpets were most common, followed by Littorina spp., and relatively few Pachygrapsus and Cyanoplax. In red algal turf plots, cover of red algal turf and other red algae were often difficult to distinguish from photos, leading to possible inconsistencies in scoring; therefore, it is best to combine these categories for trend evaluation. Through variable, red algal turf/other red algae were more common during the period 1994-2001 than thereafter, with articulated corallines showing the opposite trend. There was a tendency for red algal turf/other red algae to be more common in spring compared to fall. Ochre seastars (Pisaster ochraceus) were rare or absent from Spring 2002 to Spring 2009, after which 7-8 mostly small (40-50 mm radius) stars were found site-wide in Fall 2009 to Spring 2010. 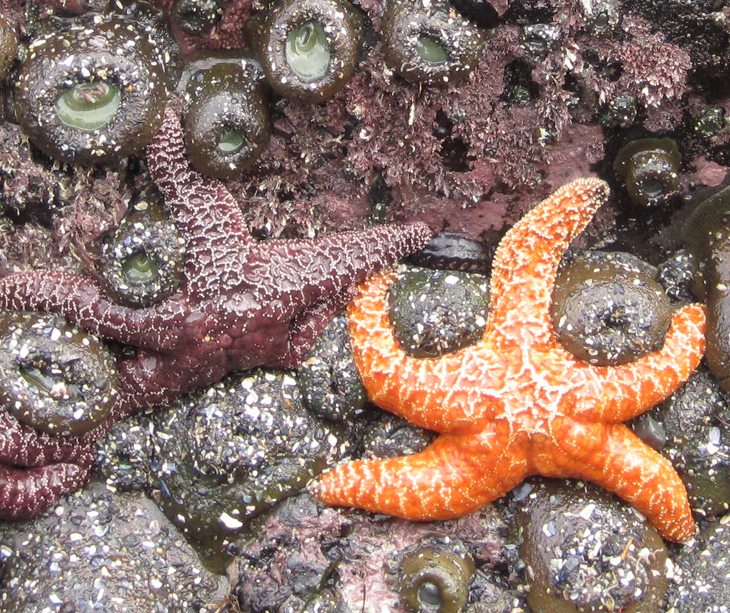 Southern California seastars experienced catastrophic declines associated with warm-water periods starting in the late 1970’s due to a bacterial “wasting” disease. Some recovery has been evident in recent years.